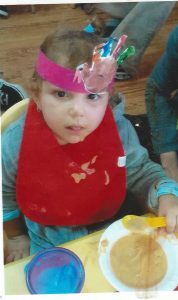 Meet 3 year-old Ashley, who was diagnosed with cerebral palsy and microcephaly. Numerous infections and other complications kept her going to the hospital. She is currently learning how to stand. Talking is also a challenge for the young child. She has many other obstacles, but one element is not difficult. Finding joy. Ashley thrives in the best ways possible. She loves going to the beach and playing in the sand. She listens to music, too. She begins to dance whenever she hears a song. Ashley also recently started school. She likes to learn new things, but more importantly the outgoing girl has a new best friend. They are inseparable and care for each other like family. We would be lucky to meet Ashley. Her kindness and courage make our world a better place. Ashley LOVES her new adaptive tricycle. She and Mom enjoy nice afternoons outside while she rides around.